In recent years, the city many hoped would help democratize China has instead become a research setting in which to study China’s increasing intolerance of dissent. Since Hong Kong’s return to Chinese sovereignty in 1997, China’s treatment of Hong Kong could be divided into three stages: non-intervention, intervention, and securitization. If the July 1 march in 2003 is a watershed that marked Beijing’s change from non-intervention to intervention, this book suggests that the Umbrella Movement in 2014 is another watershed that marked Beijing’s change from intervention to securitization. This book is a theoretically driven case study of the Umbrella Movement, a massive sit-in that paralyzed key business and retail districts for 79 days in Hong Kong in 2014. Many Hongkongers believe that they have the right to a fair election of the chief executive, and Beijing’s insistence on vetting candidates prompted the outbreak of the Umbrella Movement. Drawing insights from the securitization theory and fear appeal literature, the book proposes the framework of “security appeal.” It argues that the outbreak of the Umbrella Movement resulted from a premature use of hard repression, that is, before the government convinced the general public that the Umbrella Movement was a threat. The eventual successful securitization entails a general acceptance of the threatening nature of the Umbrella Movement and agreement with its crackdown. 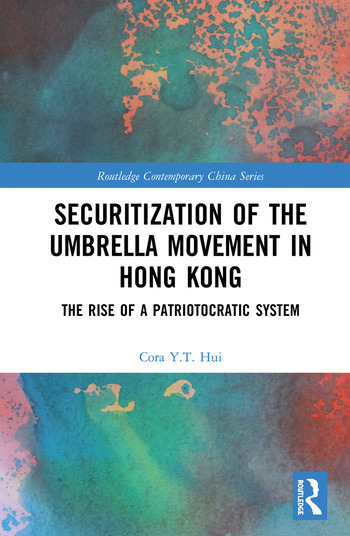 This book concludes that one of the consequences of the securitization of the Umbrella Movement is Beijing’s eventual switch to the policy of “patriotocracy” – a system that allocates power and resources based on one’s professed patriotism – in lieu of One Country, Two Systems. The policy implications and theoretical and methodological contributions of this book will be of interest to scholars and students of security studies, Chinese politics, and various social science disciplines including political science, psychology, criminology, and sociology. Chapter One – Introduction: “One Country” or “Two Systems”? Cora Y. T. Hui is completed her Ph.D. in the Department of Social and Behavioural Sciences at City University of Hong Kong. She received her MPhil in Criminology from the University of Cambridge and her MA in Forensic Psychology from John Jay College of Criminal Justice, City University of New York.